Wichita is in the Central Great Plains where masses of warm, moist air from the Gulf of Mexico collide with cold, dry air from the Arctic region to create a wide range of weather the year around. Summers are usually warm and humid, and can be very hot and dry. The winters are usually mild, with brief periods of very cold weather. The elevation is just over 1,300 feet above sea level. The terrain is basically flat with natural tree areas mainly along the Arkansas River and its tributaries. 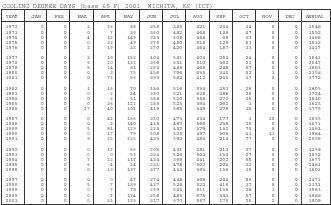 The temperature extremes for the period of weather records at Wichita range from more than 110 degrees to less than −20 degrees. Temperatures above 90 degrees occur an average of 63 days per year, while very cold temperatures below zero occur about 2 days per year. Precipitation averages about 30 inches per year, with 70 percent of that falling from April through September during the growing season. 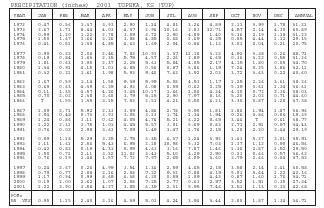 The wettest years have recorded over 50 inches. 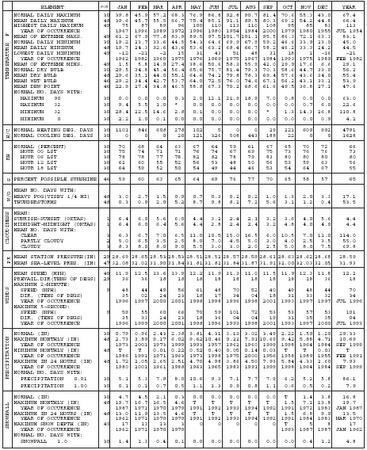 The driest years less than 15 inches. Thunderstorms occur mainly during the spring and early summer. They can be severe and cause damage from heavy rain, large hail, strong winds and tornadoes. The city of Wichita is protected against floods from the Arkansas River and its local tributaries by the Wichita–Vally Center Flood Control Project, which is designed to protect against floods up to the 75 to 100 year frequency class. 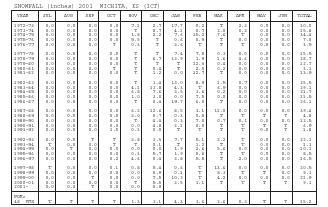 Snowfall normally is 15 inches per year, falling from December through March. 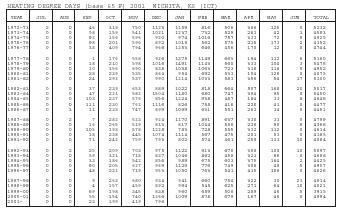 Monthly snowfalls in excess of 20 inches and 24–hour snowfalls of more than 13 inches have occurred. The prevailing wind direction is south with the windiest months March and April. July has the least wind. Strong north winds often occur with the passage of cold fronts from late fall through early spring. Extremely low wind chill factors are experienced with very cold outbreaks during the mid winter. On rare occasions during the summer, strong, hot, dry southwest winds can do considerable damage to crops. 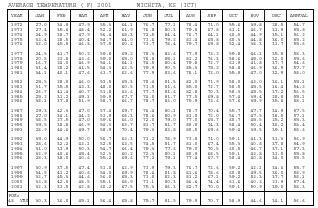 My daughter was born June of 1981 and JUST missed the hot summer of 1980, but was wanting to know if Wichita KS has had any 105+ heat since she was born in 1981.